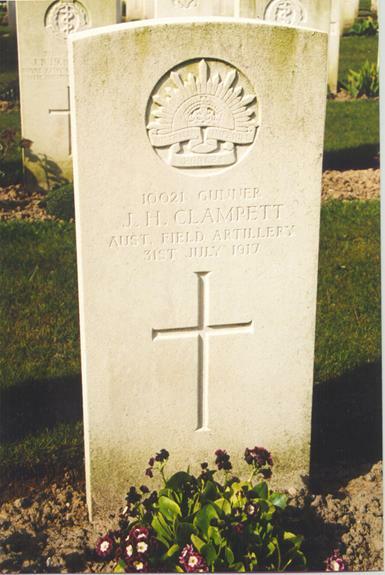 Joseph Clampett, son of John and Mary Clampett and grandson of Joseph Henry and Ellen Clampett, enlisted in the Australian Army at Sydney on 21 August 1914, he was 26 years old . His enlistment papers show his birthplace as Cootamundra NSW and his religion as Roman Catholic. He was a tall man, just over 6 foot and weighed around 12 stone with a dark complexion, blue eyes and light hair. private Joseph Clampetts army number was 196. On 19 October 1914 he embarked for the Middle East with G Company 4th Infantry Battalion per HT Euripides. Following further training he embarked from Alexandria for Gallipoli per HT Lake Mitchigan on 5 April 1915 and was one of those who landed on the first ANZAC day  25 April 1915. He was severely wounded in action at Gallipoli on that first day. They found themselves on the foot of an exceedingly steep, almost precipitous hill 300 feet high which, except for a minor lower knoll around which the boats grounded, rose straight from the bank that bordered the shingle. Joseph was evacuated to Greece via the HMTS Seang Choon and admitted to the First Australian General Hospital, Heliopolis on the 30 April 1915. He returned to Australia on 10 June 1915, for recuperation from a bullet wound to the thigh and a recurring infection, embarking at Suez per HS Kyarra and disembarking at Melbourne on the 17 June 1915. 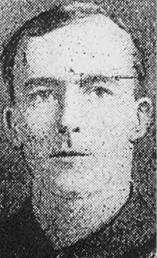 On 23 November 1915, Joseph became a Gunner and given a new army number - 10021. He was transferred to the 13th reinforcements of the 3rd Field Artillery Brigade on 23 November 1915 and left Australia once more on 17 December 1915, for the Middle East, per the HMAT Berrima . From Alexandria he embarked for France on the 23 March 1916, disembarking at Marseilles on the 29 March. On 26 May 1916, Joseph was transferred to the 21st Field Artillery Brigade, then on 13 April 1917 he was transferred yet again, this time to the 5th Battery, 1st Divisional Ammunition Column as part of the British Expeditionary Force . From December 1916 to April 1917, Joseph was in and out of hospital with gastric related illness. During this time he was transferred to hospital in England and had 15 days furlough as part of his last trip there. He returned to France on 13 April 1917. Early in the day the infantry whom the 2nd, 1st and 5th Divisions artilleries were supporting were reported to have reached the second German line and all these batteries had to go forward...The brigades of the 1st Division ...advanced at the hour laid down, 6 am. Captain Glendinning had reconnoitred a route, and Major Byrne, a spare battery commander of the 1st Brigade, having left Dickebusch with the teams shortly after midnight, now led the column, 4th, 5th, 6th, 3rd, 1st, 2nd, 102nd Batteries, in that order, across the battlefield. Pack horses, seven pairs for each gun, followed the battery limbers, so that each piece would have 108 rounds on going into action. the whole battlefield was sprinkled with bodies of infantry moving up for later stages of the attack, prisoners trailing back, mules going forward with signboards, and tanks sliding along the tracks, while above, under a low ceiling of dull cloud, aero planes wheeled so thickly that the pilots had constantly to avoid collision. The outcomes of the day saw huge numbers of casualties but little progress was made in the face of great odds. By 4 pm, when the rain had started to fall, it seems likely that Joseph Clampett was already dead. Joseph Henry Clampett was buried in the Reninghelst New Military Cemetery which is about two and three quarter miles south east of Poperinghe. Along with his personal effects, Josephs mother received his 1914/15 STAR, British War Medal, Victory Medal and Memorial Scroll, Memorial plaque and Kings Message. [ii] Bean C.E.W., Official History of Australia in the War of 1914-18. Vol 1V, The AIF in France 1917, Angus and Robertson Ltd, Sydney, 1941 p.708-709. [iii] Keegan John, The First World War, Hutchinson, London, 1998, p387.